When buying the right lawn mower for your backyard, a lot of things need to be kept in mind. From durability to ease of use and efficient grass cutting abilities, there are a lot of factors that define a cutting-edge lawn trimming tool. However, most of the models that are present in today’s market are not versatile enough to excel in more than one area of expertise. 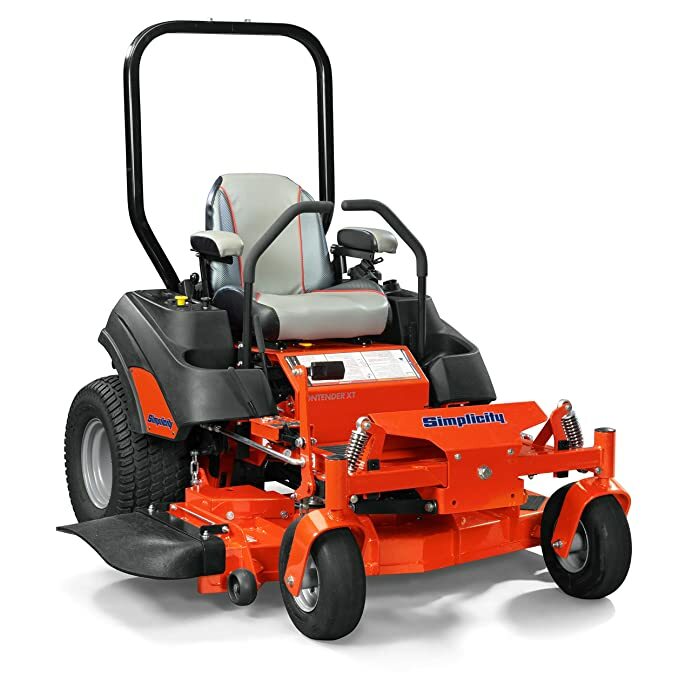 While one boasts better utility, another will be all about power and mowing speed. But the Simplicity mowers are able to do a little bit of everything. In my review today, I’ll be talking to you about these mowers that have lately taken the domestic and professional lawn trimming world by storm! And I am confident that their mowers will be able to solve all your garden maintenance problems. Simplicity Courier Reviews 2019: What did I like about the mower? What Isn’t That Great About This Mower? Simplicity Contender Reviews 2019: What’s so amazing about the Contender XT Mower? What were some of the aspects of the Contender XT that fell short of my expectations? The Simplicity Courier is decked out with a host of commercially-inspired features like fully welded frames, very strong front axles, and an exceptional suspension system which makes for enhanced comfort. Let’s take a more detailed look at what I think are its best features. All the weeds, shrubs and rocks in your garden often make for a very bumpy ride. I hate how sore I feel whenever I test out a sub-standard mower, but thankfully it wasn’t so with this one. The suspension control system present in this lawn mower is touted to decrease the force of your impact by 25% as compared to traditional lawn mowers. While I don’t know how accurate that figure is, it did feel comfortable enough and only when I was running it over large rocks that I felt discomfort. The mesh seat is also ergonomically shaped and keeps you cool and comfortable. The cargo utility belt that is optional was a very nice touch as well as it lets you carry up to 50 lbs of whatever you want. 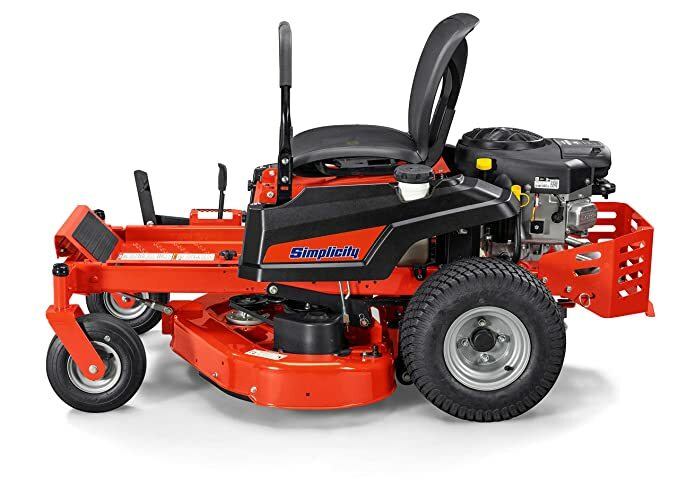 This lawn mower is equipped with a pretty powerful V-twin engine from the trusty Briggs & Stratton (you also have the option of getting a Kawasaki engine). The engine is 23 HP and 724 cc and can hold fuel up to 3 gallons. There are no chokes or primes, and you can start it very easily with the press of a button. The 42 inches steel deck with three blades lets you cut a large area of your lawn with one trim, and the speed of the mower is pretty impressive too (I took it up to 7 mph). The steering is pretty easy and intuitive, and the mower even has an integrated parking brake. I like my garden trimmed down as much as possible, so I set the cutting height to the smallest setting of 1.5 inches. There are a total of thirteen cut-height positions up to a maximum of 4.5 inches, which is a pretty good range. If there’s one aspect about the Simplicity Courier that we have no complaints about whatsoever, it’s the durability. It looks pretty durable, and it feels even more so. It has a fully welded steel frame and a very thick walled front axle which can pivot. The 12 gauge steel fabricated mower deck can plow through the strongest of weeds. The aluminum ball bearings in the cast spindle complete the ensemble and make for a very durable machine that will last for years to come. This is a pretty good lawnmower by most standards and is going to be more than sufficient for every homeowner. If you are looking to take it out commercially, you might want a bigger mower deck. However, remember that a bigger mowing deck comes at the price of maneuverability, as you can’t get into those hard-to-reach corners if you have a very large mowing deck. Also, a bigger mower deck will make this lawnmower even bulkier than it is. I wanted to store this lawnmower in my garage, but it was simply taking up way too much valuable space inside, so I just kept it outside on the lawn. How do you start this lawnmower? It has an electric start switch. There is no choke. What is the maximum forward and backward speed? It goes up to 7 mph forward and up to 4 mph backward. Is it a commercial or consumer mower? It is rated as a consumer mower. However, I think that it is just as suited for commercial use as well. Just remember that the size of the mowing deck is 42 inches, so your lawn has to be moderately big. 3 years for consumer warranty or 90 days for commercial warranty. The deck shell has a lifetime warranty. The Simplicity Contender XT Mower is all about providing commercial-grade features but at a very affordable price. Its powerful Briggs and Stratton engine along with the tough and durable Hydro-Gear Transaxles makes this machine just perfect for both professional and domestic use. But along with power, this mower boasts incredible versatility as well. It has an integrated cargo bed that adds additional on the go convenience and helps you carry extra tools, plants and a lot more. So here are some of my experiences with it. The mower’s grass cutting power and maneuverability are what attracted me the most towards it. It helped me get done with the golf course in a matter of hours! Where most average machines would take up a day at the very least, the Contender allowed me to do it in record time. It comes with a heavy-duty mower deck that is made out of rugged 10-gauge steel along with a reinforced top. 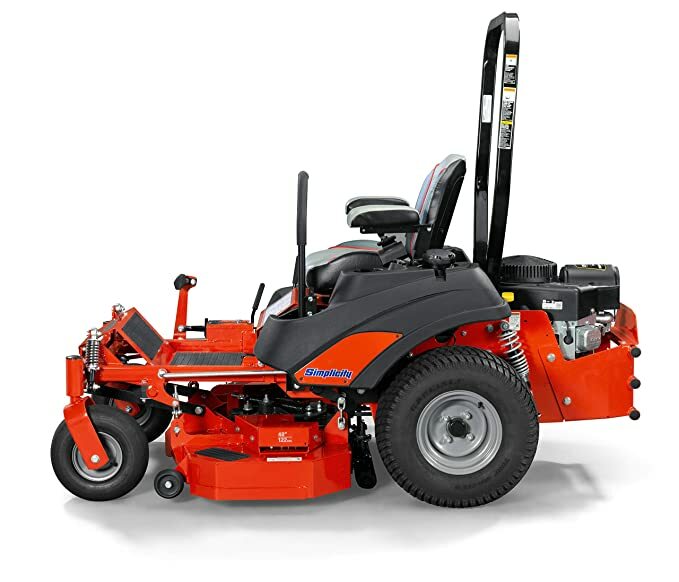 This along with the Briggs and Stratton engine allows the mower to go through thick and tough grass effortlessly while giving an even trim at the same time as well. The engine is designed to be long-lasting. And it has a five-step integrated air management system, which gives one of the best dust and debris protection that you will find on the market. It’s essential for a powerful lawn mower to cut grass evenly no matter what the size and toughness of the lawn, and the Contender XT is able to do just that. 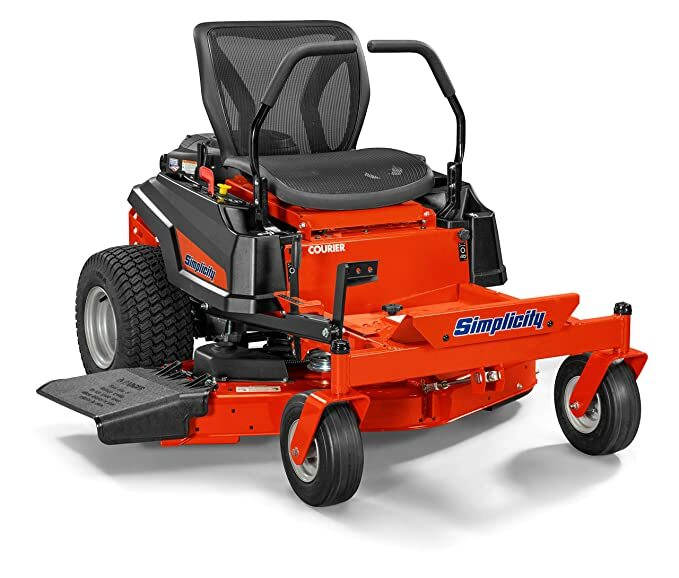 This mower comes with a special deck lift system that makes adjusting the fabricated blades feel like a breeze. I did not have to wrestle with heavy levers when doing the golf course job. Even when I needed to cut grass at different heights throughout the field, all I had to do was push the foot pedal and move the pin to achieve the desired cutting height. For easy maneuverability, the mower is equipped with Hydro-Gear Transaxles which help the mower to deliver continuous torque. This allows a smooth treading speed even on bumpy terrain along with convenient bi-directional controls so that you can maximize your trimming time to get the job done as soon as possible. Moreover, the mower also comes with front and rear suspensions. The adjustable rear coil-over shocks have a pivoting front axle that absorbs the shocks that arise from treading over bumpy terrain. This increases ride comfort as well as mowing productivity. 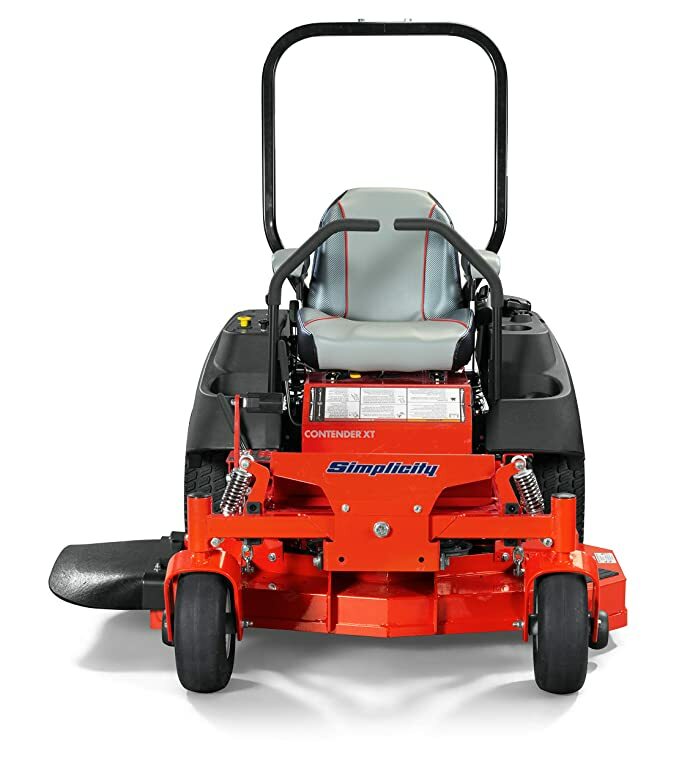 The Contender XT from Simplicity may be a cutting beast from all angles, but it’s an uncomfortable mower to use for prolonged trimming jobs. The deck might be generous and vibration proof, but it’s the deck seat that I have a problem with. It leans back way too much, and the back support is almost non-existent. However, the quality of the seat is quite good as it is made of breathable materials, but I would’ve appreciated it even more if Simplicity was able to provide this mower with a seat that had a higher back. How exactly does the triple catcher system of the mower work? And does it come with the product or do you have to buy it separately? To start off, let me just mention that the triple catcher bagging system does not come with the mower and you’ll need to purchase it separately. The kit can be installed at the back of the mower, where a tube or chute will connect the bags to the cutting deck and automatically collect the grass clippings into the three easy to empty bags. What is the recommended inclination for the Contender XT, and is it for across or straight up and down? I would recommend that you don’t cross the slope angle of 15 degrees as the mower might just stop to work after. And this angle recommendation is for both across the face of the slope and straight up and down. If you’re looking for a powerful grass cutting machine for quick and short lawn mowing jobs, then the Simplicity mowers might just be able to fit your needs perfectly. Their mowers are as easy to use as they are versatile, and are bound to make quick work of any lawn trimming job you put it through.